Freddie Mercury is irreplaceable. Adam Lambert admits as much very early into the show, encouraging the crowd to celebrate Queen's work and Mercury's achievements and by so doing breaks the ice, giving permission to the crowd to relax into enjoyment of Queen's phenomenal body of work without guilt. Not everything Lambert does, in terms of gestures and demeanour, is to my taste and I keep being reminded of George Michael instead of Mercury, however, there is no doubt Lambert has a fine voice and is up there with the best people to at least try to hold a candle to a national treasure. With that issue out of the way there is no doubt that Queen plus Lambert is a phenomenal show with interesting large-scale projection lighting and prop effects on the theme of a large robot, my favourite of which was the large robotic hand that lifts Brian May up for his solo and the phenomenal musicianship, particularly of May whose guitar tone is unmistakeable. Roger Taylor is, of course, also much higher profile than most drummers and it's good to see him coming front stage to sing on a couple of songs and taking his kit to the front end of the catwalk stage, with Lambert engaging with him in a manner that shows they are very comfortable working together. It is, of course, hit after hit with all favourites present and correct with the exception of 'Flash'. Highlights are 'Killer Queen' with Lambert sitting on the Robot's head as it rose high into the air and 'Don't Stop Me Now' with that amazing solo from May which never disappoints. It is also lovely to see May take control of proceedings as master of ceremonies, thanking the audience and singing an acoustic version of 'Love Of My Life' despite not being in full voice. He gets the crowd to hold their lighters aloft and I must admit a large projection of Mercury joining into the song brings a tear to the eye. May closes the session where he somehow manages to create an intimate atmosphere in a stadium with a panoramic crowd selfie. May has always kept the human touch and is famous for his generous and gracious approach to his fans. He tells the crowd he has every one of them on his photo and it's something everyone wants to believe. Taylor comes though the floor on a drum kit and this section concludes with May, Taylor and Lambert singing 'Somebody To Love' bang in the centre of the crowd. Vocal highlights include 'I Want To Break Free' and 'Who Wants To Live Forever', which show off the Operatic and passionate nature of Lambert's voice and which are fine versions. On the other hand, during 'Radio Ga Ga' (to my ear anyway) his version is no substitute for Mercury's distinctive version ingrained upon my consciousness over the years. However, the obligatory 'Bohemian Rhapsody' ticks all the boxes with the special moment being May's superb unmistakeable solo which he renders in a silver baggy like cape top in a reminder of halcyon days. We get a final appearance from Mercury in a bright yellow biker jacket for an interactive question and answer singing session with the crowd. The finale is 'We Are The Champions' with a big vocal finish, white confetti and the national anthem. Lambert gets a huge rip your head off cheer at the end, but the cheer for May and Taylor is even louder, longer and befitting the legends that they are. May looks genuinely grateful as the wonderful human being he is. 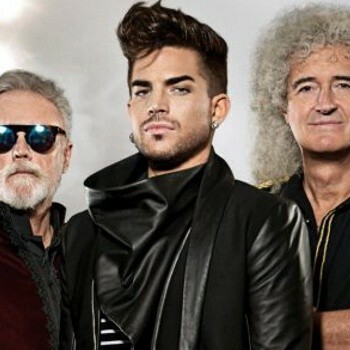 With or without Mercury, I would pay to see the remaining members of Queen. By presenting the show with Lambert they have come up with an extravaganza to meet high entertainment standards with wide appeal. I certainly don't mind a regular reminder of Mercury and need no excuse to hear songs of my youth.